No One Is Alone: Patrick Mulryan, Ben Steinfeld, Claire Karpen and Emily Young in a scence from the Fiasco Theater's "Into the Woods" revival. These "Woods" have been defoliated. 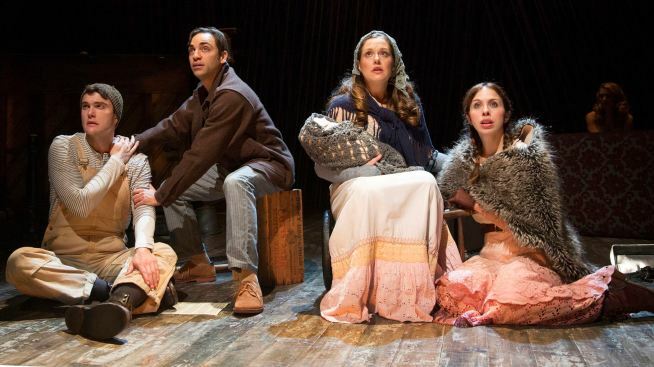 There are just 10 actors and one major set piece—a piano—in the Fiasco Theater’s inventive Off-Broadway take on "Into the Woods," the favorite Stephen Sondheim-James Lapine musical, now open at the Roundabout’s Laura Pels Theatre. While this latest revival surely stands to benefit from Disney’s recent moment with the parable, it also stands in razor-sharp contrast to the box office hit, which boasts a lush CGI beanstalk and a towering, village-crushing giantess. There’s nothing towering or gigantic about this production of the “after happily ever after” musical, first presented at Princeton’s McCarter Theater in 2013 (and arriving in New York with the same cast). To create the image of a giant in the story’s climactic moments, a Fiasco company member merely shines a handheld downstage spotlight onto an actress, whose shadow looms large onto a curtain behind her. The innovations drop like golden eggs from a goose during the 2-hour and 40-minute performance, co-directed by Noah Brody and Ben Steinfeld, who appear respectively as the Wolf and the Baker. Brody’s Wolf arrives on stage clutching the mounted head of a lupine, as it might have been prepared by the local taxidermist (take that, Johnny Depp). A dressmaker’s mannequin does stand-in as the tree at the grave of Cinderella’s mother. Folded paper transforms into the birds who assist her in their endeavors. That goose and the golden egg? It’s a feather duster and a glittery Christmas ornament. And so on. The tricks serve to create a distilled, acoustic “Into the Woods” that forces us to focus on the bare bones of the story: we have our fairy tales, but this here, in the second act, is how life really is. The performances, particularly Emily Young’s winking Little Red, assume an intimate knowledge of the story (Young doubles as Rapunzel). This production will be most appreciated by theatergoers already familiar with the material. You could not ask for a more interesting Milky White, who comes off as sullen, yet remarkably human thanks to a winning interpretation by Andy Grotelueschen, who “Moos!” and rings his cowbell at all the right moments—there’s no costume here. I was equally taken with regional theater vet Claire Karpen’s crystalline-voiced Cinderella. Jennifer Mudge, last seen as Adrian’s confident pal in Broadway’s “Rocky,” makes for an imposing witch (in spite of the grandmotherly knit shmata on her shoulders), while co-helmer Steinfeld is an even-keeled Baker. All the action transpires against a set framed by a surrealist’s landscape of piano keys, harps and other instrument parts. As in John Doyle’s far glitzier Sondheim revivals, the actors here double as musicians, playing cello or bassoon, though usually off to one side of the stage. The piano proves to be an excellent makeshift cliff for the climactic death of the Baker’s Wife (the appealing Jessie Austrian). At times, the sameness of the cast (is it me, or are these woods due for some diversity planting?) was distracting. Because the talented actors seem to be in the same age range and type, including the ones playing Jack (Patrick Mulryan) and Little Red (Young and Brody are pictured, above), the characters aren’t sharply differentiated. It may not sound like a hindrance, but you notice it during the second act finale, as the Baker and Cinderella are promising to take care of the orphaned children … who are taller than they. The members of the Fiasco company have the resourcefulness of a community theater in how they land “Into the Woods” on what is surely a modest budget. Sometimes, what they come up with hits the mark—sometimes it doesn’t quite. Still, we’d gladly hand over five magic beans to watch them do their thing. “Into the Woods,” through March 21 at the Laura Pels Theatre, 111 W. 46th St. Tickets: $99. Call 212-719-1913.